So out came the cukes – had my son peel and slice them while I got to season the cottage cheese and in less than 5 minutes, we had a, if I may say so myself, “deliciously” wholesome and healthy snack which was devoured in literally 2 minutes by my hungry teenagers (not before I took pictures, though J– Can there be anything more satisfying than that? And I think this is a pretty decent dish to serve as an appetizer or snack at a party! 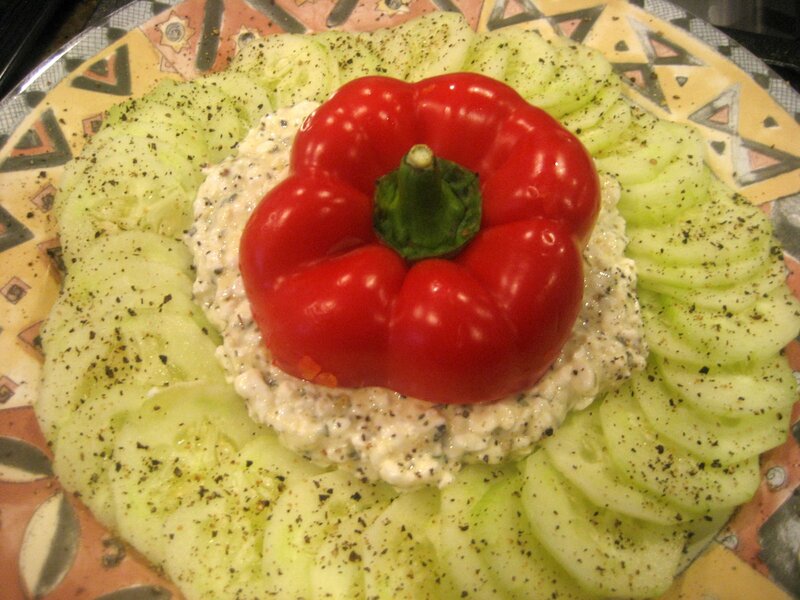 Get a decorative plate and place the cucumbers in a domino circle around the edge. For purely decorative and picture purposes, I cut the head of a red bell pepper and placed it in the centre. Thank you Malli of Mallis Mint and Mimosas and her wonderful comments and for sharing her FIRST lovely blog with me. Means a lot to be recognized – Thanks Malli! Very refreshing, inviting and beautiful salad.. I love salads …the presentation looks great! Such a healthy,delicious and refreshing salad. the salad looks very good!..yummy! Healthy and a wonderful salad!! Lovely presentation! It does sound like a deliciously wholesome snack, I need to try this! This salad was SOOOOOOOOOOOOOOO good! Love the arrangement and idea, simply superb.